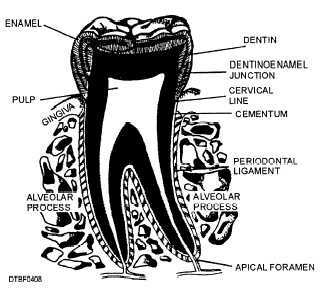 The chief function of the pulp is the formation of dentin. However, it also furnishes nourishment to the dentin; provides sensation to the tooth, and responds to irritation, either by forming reparative secondary dentin or by becoming inflamed. The pulp chamber contains the coronal pulp and pulp horns located within the crown portion of the tooth. The apical foramen is at the end or apex of the radicular pulp. Blood vessels, nerves, and connective tissue pass through this area to reach the interior of the tooth. The tissues that surround and support the teeth are collectively called the periodontium. Their main functions are to support, protect, and provide nourishment to the teeth. Figure 4-8 illustrates the supporting tissues of the periodontium. The periodontium consists of cementum, alveolar process of the maxillae and mandible, periodontal ligament, and gingiva. Cementum is the only tissue considered as both a basic part of the tooth and a component of the periodontium. It is a thin, calcified layer of tissue that completely covers the dentin of the tooth root. Cementum is forming during the development of the root and throughout the life of the tooth. Cementum functions as an area of attachment for the periodontal ligament fibers. The alveolar process (fig. 4-8) is that bony portion of the maxilla and mandible where the teeth are embedded and by which tooth roots are supported. The alveolar socket is the cavity within the alveolar process in which the root of the tooth is held by the periodontal ligament. The bone that divides one socket from another is called the interdental septum. When multirooted teeth are present, the bone is called the interradicular septum. The alveolar process includes the cortical plate, alveolar crest, trabecular bone, and the alveolar bone proper. Structurally, the cortical plate is composed of lingual and facial plates of compact bone. It is dense in nature and provides strength and protection and acts as the attachment for skeletal muscles. The mandibular cortical plate is more dense than the maxilla cortical plate and has fewer perforations for the passage of nerves and blood vessels. The alveolar crest is the highest point of the alveolar ridge and joins the facial and lingual cortical plates. Figure 4-8. - The periodontium.